Medjugorje is situated in Bosnia Herzegovina in a mountainous region inland from the Adriatic sea. It is 150km from Split and 130km from Dubrovnik. 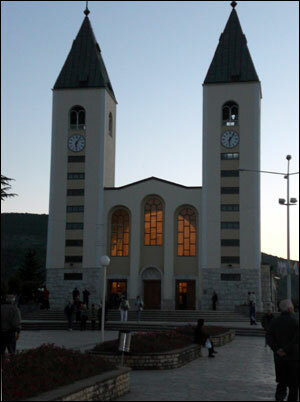 The parish of Medjugorje was first mentioned in historical documents in 1599. Tobacco and grapes were always a very good source of livelihood but this has steadily changed as Medjugorje expands to cater for the ever increasing numbers of pilgrims. Ever since six teenagers saw an apparition of our lady on a barren hillside now called Apparition Hill, millions of pilgrims have come from all over the world to this sacred place. It has become one of the largest pilgrimage site in the world. 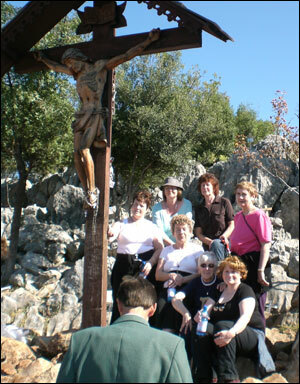 Miracles have been reported by people who have visited Medjugorje, and there is a footpath, which is lined with the stations of the cross and used by most of the pilgrims who climb Mount Krizevac. St James’s Church is situated in the middle of the town and is the central place of prayer. The Exterior Alter which is situated at the back of St.James's Church enables in excess of 5,000 pilgrims to pray in the open air. This is particularly useful during the long hot summer months. As well as the celebration of Mass this space is used for other events such as the Youth Festival and concerts of classical and gospel music. Behind the Church of St James and the Exterior Alter there is a large bronze statue symbolising the Resurrection. Around the statue there is fourteen stations of the way of the Cross. From the knee of the statue there is a tear shaped drip, which appears viscid and sticky to the touch. Pilgrims who are unable to climb the mountains are encouraged to pray the Way of The Cross in the grounds of the bronze statue where seating is also provided. The information booth operates daily except on Sundays and feast days. It provides every possible type of information to pilgrims, for example, arranging a meeting of pilgrims with one of the visionaries. This is organised daily on the shrine premises and is usually at 08:30hrs. It is also possible to arrange meetings with priests who are working in the shrine. The prayer programme for the day is announced following each Mass in St James's Church. Bijakovic is a small village in the parish of Medjugorje and is located under Mt.Krizevac. There are many old and well preserved houses in the village and the narrow streets lead the pilgrims to Apparition Hill. Climbing up the hill, pilgrims come to the place of the first apparition where our lady’s statue is placed. This area is extremely peaceful and after praying the Rosary many pilgrims leave messages written on the stones. According to the visionaries it is at this very place that Our Lady is going to leave a long lasting and indestructible sign when she stops appearing to them. When the six young visionaries were banned by the police from going for a walk on Apparition Hill they met with the people where the blue cross is today. In 1934 the parishioners built a concrete cross 8.5 meters high on the top of the hill. Krizevac is the Calvary of Medjugorje. The village was formed to provide abandoned children with care and education. Here children are prepared for school and a self – reliant life. The aim of the garden is to bring people back to their authentic environment and to find peace and relaxation. The garden has a therapeutic dimension.and consists of pine trees, ash, oak, maple, hedges and hornbeam. This is a community established for young men who have had difficult lives but are looking to get back to leading a normal life. More recently a community for girls has also been established. Young people from all over the world gather for the annual youth festival which is of a religious nature, which takes place at the beginning of August for six days. The town is 25km from Medjugorje and pilgrims visit because priests were killed here and burned to death in World War Two. Fr. Yozo who was parish priest in Medjugorje in 1981 now carries out his pastoral work here. Tilahjina is also 25km from Medjugorje and is regularly visited by pilgrims in quest of peace and prayer. Fr Yozo Zovko became parish priest here in the mid 1980s.